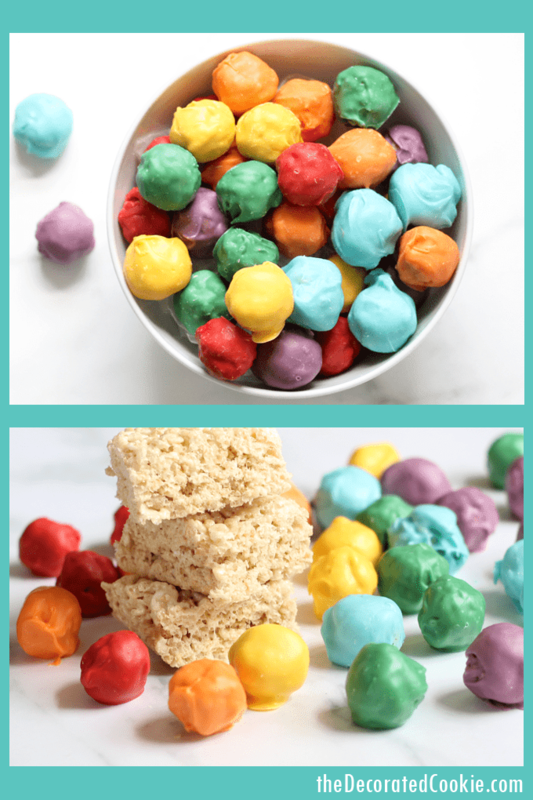 These rainbow Rice Krispie treat bites are addictive, delicious pops of color to serve at your rainbow or unicorn party, or make them just for fun! 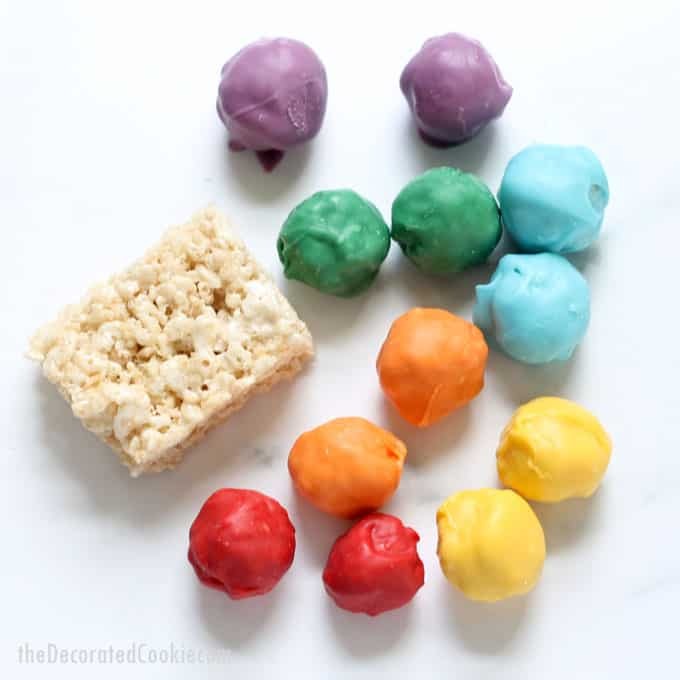 I’m pretty sure rainbow Rice Krispie treat bites would be a unicorn’s favorite snack. They are the perfect size for popping in your mouth. They are all the colors of the rainbow. And they are easy to make. I can’t imagine eating Rice Krispie Treats any other way now. They are so conveniently-sized for parties or for packaging in lunch boxes. 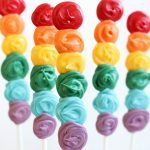 Looking for more fun food ideas for your rainbow or unicorn party? 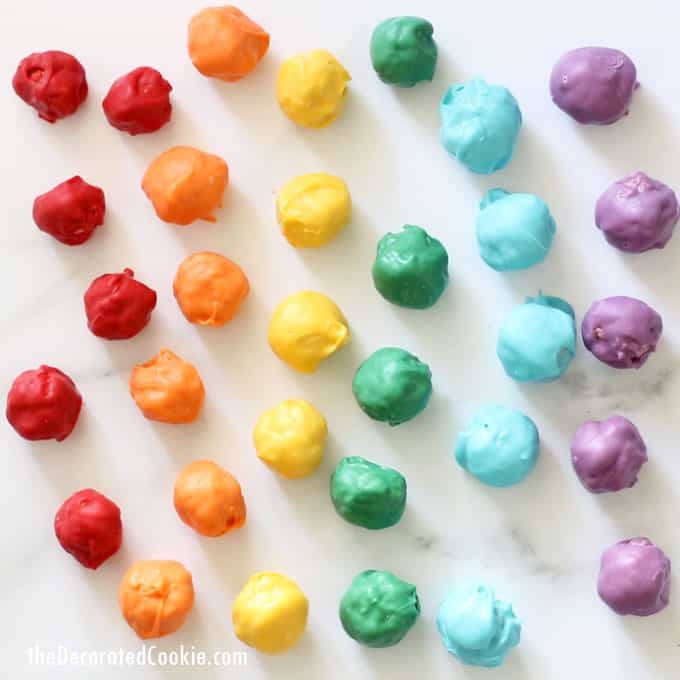 Find all kinds of rainbow food ideas here. 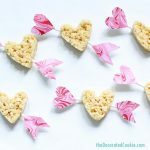 These Rice Krispie treats would go well with some rainbow s’mores or rainbow popcorn. 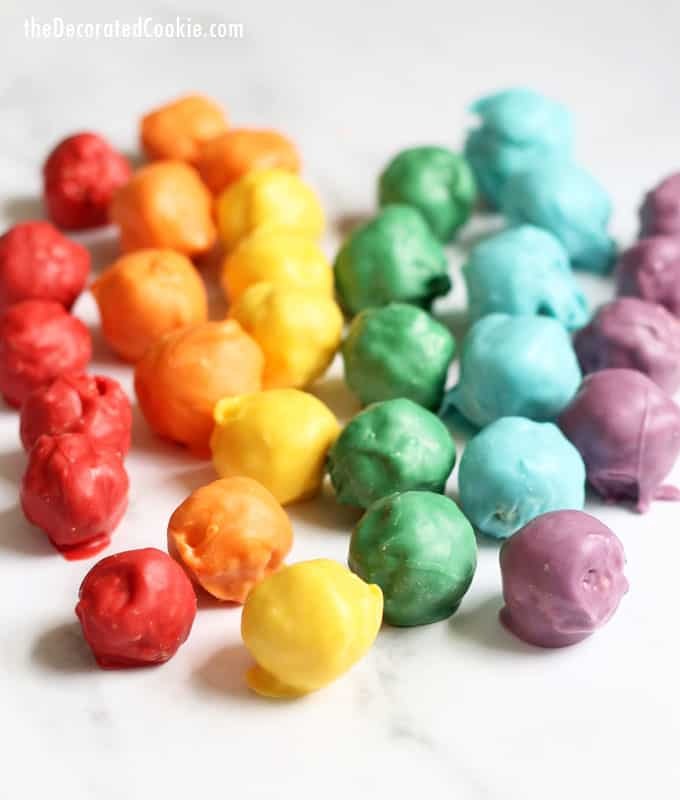 A few notes on making these rainbow treats: You may substitute store-bought Rice Krispie Treats if you like, to speed things along. 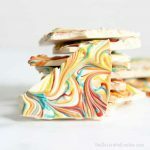 If you prefer to use white chocolate instead of candy melts, you are welcome to do so. However, I recommend you use oil-based candy colors and not regular food coloring. 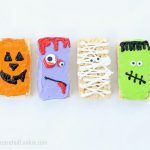 Cut your prepared Rice Krispie Treats into 1-inch squares. Shape each square into a ball. 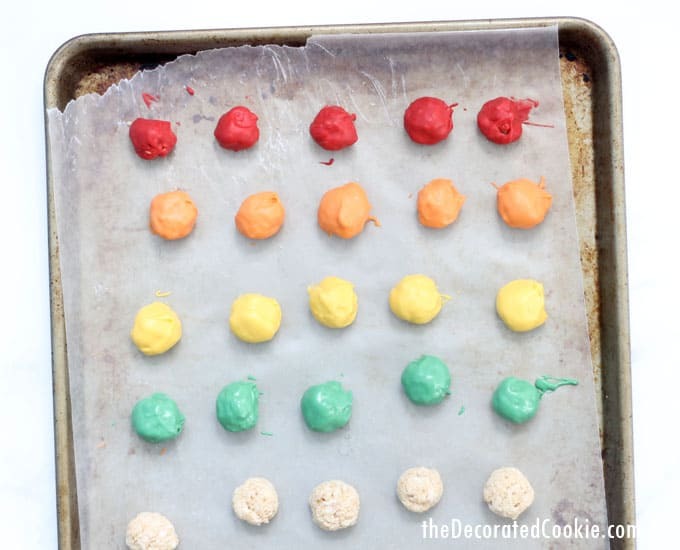 TIP: Use a melon baller to help shape the Krispie treat balls. Each ball will be about 3/4-inch in diameter. 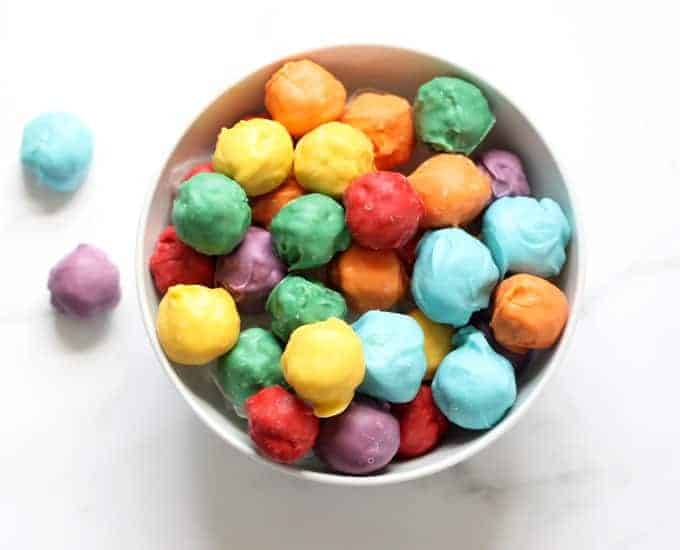 In a small, microwave-safe bowl, melt 1/2 cup of one color of candy melts with a pinch of the EZ Thins (EZ Thins are optional, but they help achieve a better dipping consistency.) To melt, microwave at 70 percent power for 90 seconds. Stir, and continue to microwave in 15-second intervals until about three-quarters of the melts are melted. Stir, using the residual heat to fully melt the candy. 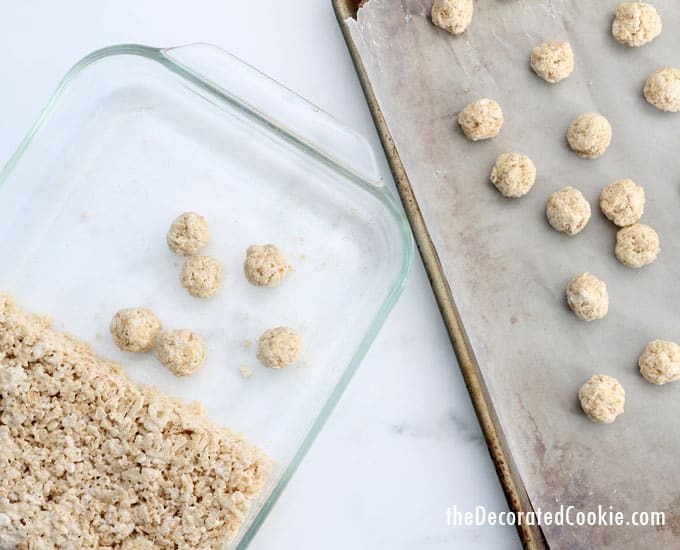 Makes about 65 Rice Krispie Treat bites if using a full recipe in a 13 x 9 inch pan.